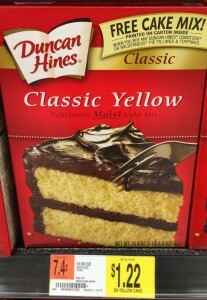 Duncan Hines Classic Yellow Cake only $0.37 at Walmart! Get Duncan Hines Classic Yellow Cake for only $0.37 at Walmart! Use the $0.35/1 printable coupon that’s available and get $0.50 Ibotta Deposit for this awesome deal. Be sure to check out the rest of the Walmart Coupons & Deals for this week before you shop! Holiday Decorating and Entertaining Ideas from Sabrina Soto!